The good people at Almondina sent me a birthday present. It might have something to do with this fine blog we run here, but two packages of the low-fat cookies arrived in the mail about two weeks ago, and Sonia and I enjoyed them enough to allow them to join an extremely exclusive, elite group of non-Trader Joe's brand foods that have been reviewed here on our blog, including Espiral Vinho Verde Wine, Gum's the Word Sugar Free Gum, and Mikawaya Mochi Ice Cream. 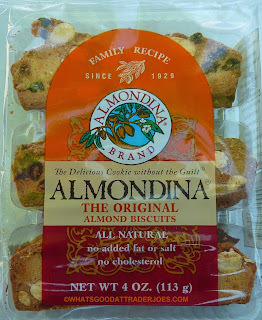 As was the case with the products in those previous posts, Almondina is widely available at Trader Joe's stores, although it's not sold exclusively there. These thin, crunchy biscuits are clearly optimized for dunking in coffee, tea, milk, or what-have-you, but they also make a nice stand-alone snack. The texture is great. It's not unlike types of biscotti I've tried, but perhaps a little thinner and less rigid. 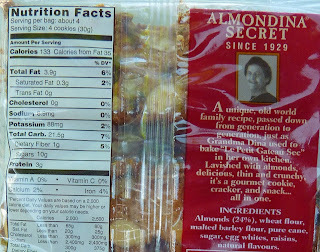 I'll be honest, the cookie part alone is decent, especially considering it's so low in fat, salt, and cholesterol, but it probably wouldn't have done it for me by itself. 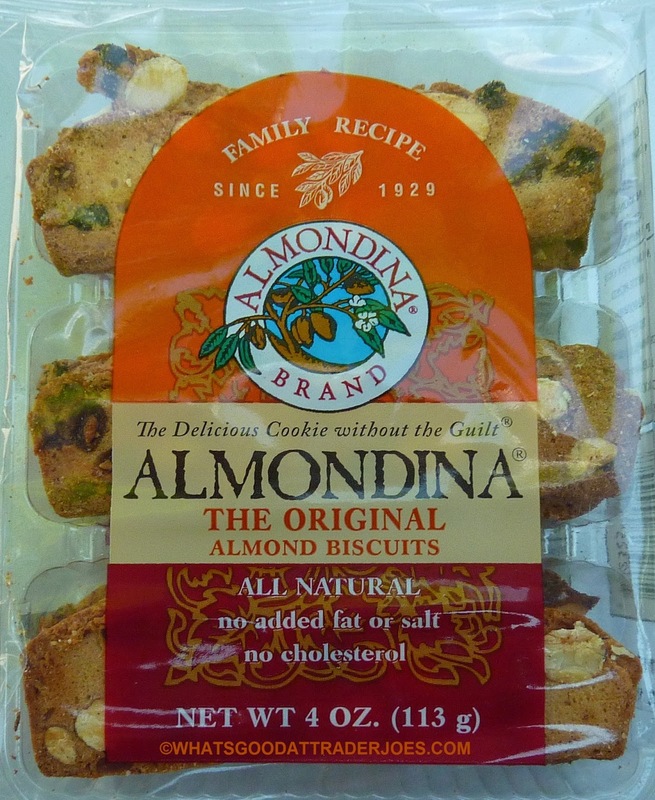 The true genius of these cookies is the way almonds and raisins are seamlessly woven into the fabric of the confection—in fact, almonds constitute a full 24% of the product, a fact that's easily believed just by visually inspecting the biscuits. The fruit, nut, and cookie elements blend together well and make for a highly versatile breakfast/snack/dunkable/dessert. 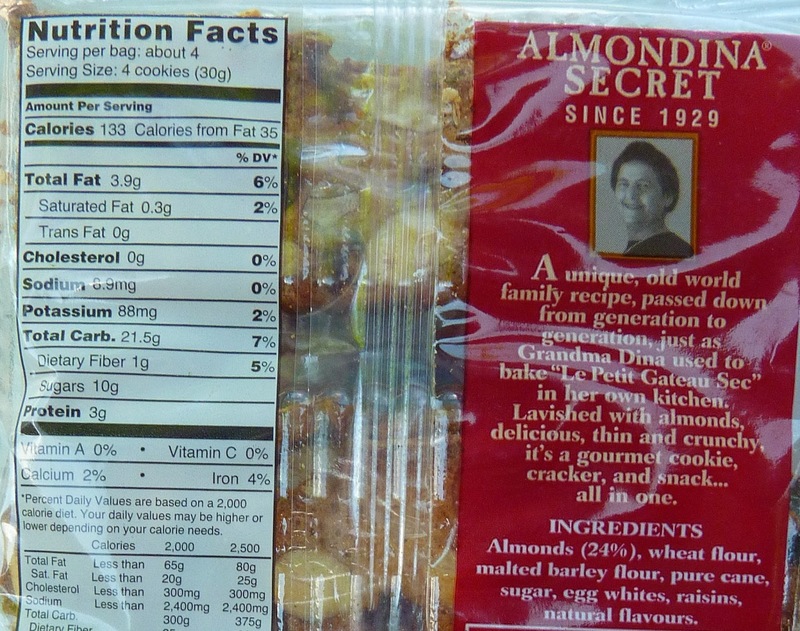 Sonia and I will both throw out solid fours for these tasty, low-guilt treats. "Really darn good" all the way. Hi! Can you guys PLEASE PLEASE PLEASE try the new Mango Babka I know you only rated a 6.5 on the Chocolate Babka but I'm really interested in your opinion on the new mango one. I have been hearing very mixed reviews about it but, I feel like I can trust you guys the most on your review Thanks! PS- I LOVE your blog I LITERALLY don't know how I lived before it KEEP UP THE GREAT WORK! Hi Camille. Thanks for your kind words about our blog! I'm sure one of us will get to the mango babka before the mango storm subsides. Stay tuned! Happy birthday! I haven't yet seen TJ's making birthday cake theme. They should do that. Birthday cake everything. Birthday cake "cookie" butter. Birthday cake yogurt. Birthday cake sheet cakes. Just got back from TJ's and I don't know if this is only a DC-area product, at my store in Bethesda, MD they now have White House Cookie Kits (similar to Gingerbread House kits)for the Independence Day. The kits are only 7.99 and are absolutely adorable. The finished product is very life-like, if you can say that about a building. Go now and buy one, because these will sell out VERY quickly. I am not currently in DC for a while. I have seen photos of it. I think it is cute. They could bring it back near the election day too. D Kessler, I would be happy to mail you a White House Cookie Kit, if they don't have them in Seattle. BTW, the store is located at Bradley Blvd and Wisconsin Ave.